Ted: Well, it looks like we have two girls for one part. Bill: I'm glad you caught on. 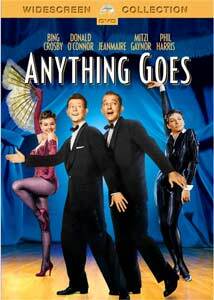 1956's Anything Goes is the movie equivalent of junk food; it's sort of tasty, goes down easily, and is quickly forgotten. At least it doesn't make you fat. Starring Bing Crosby and Donald O'Connor, with quality support on the ladies' side from Mitzi Gaynor and Jeanmaire, this is a well-shot, cleanly delivered production that doesn't leave much of an impression. But with Cole Porter tunes and some good dance numbers, there is nourishment to be had. The story and screenplay, such as it is, was written by hack novelist Sidney Sheldon, which might explain the trite nature of the film. It has little to do with the original stage production, beyond using some of the songs. Our tale involves Bill Benson (Crosby), star of the musical stage. He is preparing to mount a new show, and he is to star with television phenom Ted Adams (O'Connor). Their problem is finding a suitable leading lady. Each departs for Europe, Bill to London and Ted to Paris. Wouldn't you know it, but each goes and signs up a leading lady on their own. Bill sees Patsy Blair (Gaynor) perform and is wowed. Ted discovers the charms of Gaby Duval (Jeanmaire), and is equally impressed. Cue confusion, as each wants the other to dump his signing, only to discover that each man is falling in love with that other woman. Somehow, during the cruise ship crossing to New York, they will have to sort this out so everyone can star in the show and go home happy. Given the fairly lame nature of the script, this still plays pretty well, with O'Connor the real standout, as he is allowed to use his physical comedy skills as well as his dancing in a series of numbers. Der Bingle is genial, but has zero chemistry with Jeanmaire. Both women have unflattering hair but great costumes; they are each allowed to shine in their respective numbers, Gaynor in Anything Goes, and Jeanmaire in a lengthy ballet fantasia, choreographed by her husband, Roland Petit. Both men do fine with the songs, which include classics like All Through the Night, You're the Top, and It's De-lovely. For reasons I am unaware of, further songs by Sammy Cahn and James Van Heusen are included, and they are not up to Porter's high standard (what could be), though they are pleasant enough. O'Connor and Gaynor do an especially nice job on It's De-lovely, set on the deck of the cruise ship. It should be noted that at least a couple of the Porter songs have altered lyrics, to protect the gentle psyches of the audience. Anything Goes has the line about authors using "four-letter words" changed to "three-letter words," and I Get a Kick Out of You removes the reference to cocaine. Silly now, but I guess this was a threat to the nation at the time. Insert much eye-rolling here. The problem with the show is that it just doesn't have a spark to lift it beyond the banal script; everything is kept at a pleasant but unchallenging pitch, and there is really no dramatic tension to draw the story along. Even when the ladies dump their man, we never really feel like there is even the faintest scintilla of doubt that things will not work out. Crosby is so nonchalant about the whole thing you can hardly believe he's in love in the first place. If you enjoy musicals, odds are you'll find something to enjoy here; I certainly did. But don't go in with great expectations. Just expect some cinematic candy, and you'll probably go home happy. Image Transfer Review: The VistaVision, Technicolor image is framed at about 1.66:1, and looks quite nice. The source material has few noticeable blemishes aside from the odd stray bit of dirt and such, and the colors remain vibrant and beautiful. Audio Transfer Review: A choice of Dolby 5.1 and Mono are provided, and the 5.1 track sounds livelier and richer than the mono. In case you find Jeanmaire's dialogue hard to fathom at times with her French accent, English subtitles are provided. Extras Review: None, beyond chapter selections, and let's face it, that's not an extra. Stale and dramatically flat , but with good numbers from the four leads to redeem it, Anything Goes is strictly second rate in the world of movie musicals. The DVD at least provides a quality audio/visual experience to allow viewers to judge its worth for themselves.